Only this year, after long preparations and communication with the local authorities, it started going in the right direction and the dream begins to unravel successfully. The event involved Adam Franc and Vojta ‘Klokan’ Klokočka, both 12 years old. 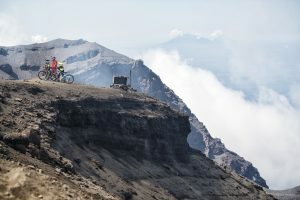 Both being talented bikers, with whom I’ve had experience in the past, and I knew they can cope with such a strenuous challenge as the volcano downhill. 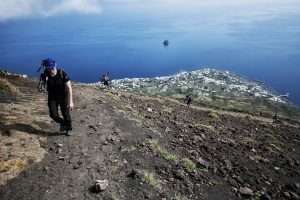 With a big load on our backs, trudging through a not exactly solid terrain with loose rocks, the way up was not so smooth but we’ve already had half of the Stromboli climb behind us and the Strombolichio islet started disappearing in the distance… and we were also running out of energy biscuits. The Stromboli summit (Vancori) is sprinkled with a few monitoring stations that transmit information through the system into the control centre. The regular cellphone signal is out of reach. 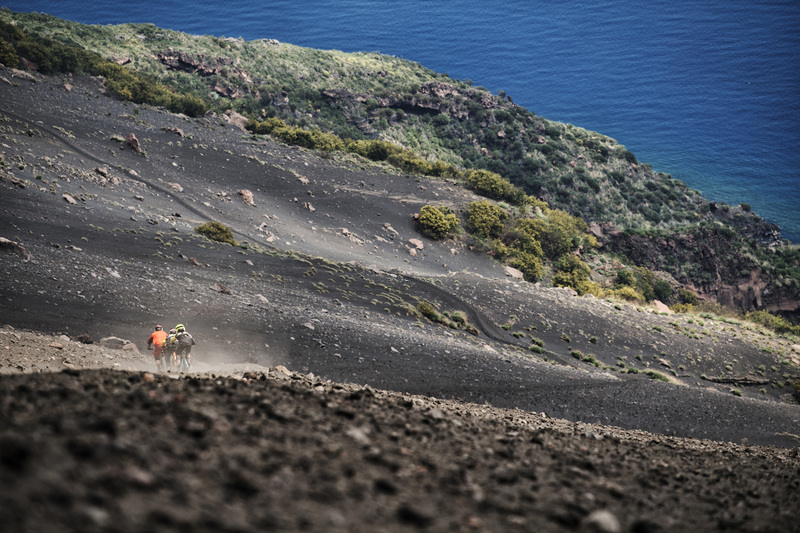 Gaspi draws the arches in the Stromboli dust, but he’s to be careful not to get carried away by the speed. Braking is mighty tricky here. In the middle of April 2017, we found ourselves preparing our adventure car and throwing in baggage for unbelievable 11 people: in addition to the riders the expedition includes cameraman Márty Smolík, photographer Miloš Štáfek (the finalist of Red Bull Illume International Photo Competition), the fathers of both young boys, and things for the support team. Part of the support team will join us a few days later by air, for the sake of saving time. 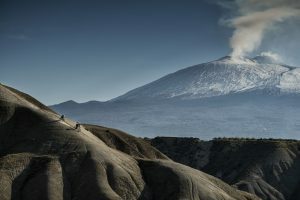 The first camp is set up in an amazing resort in the shadow of the Sicilian Etna volcano below Biancavilla, where, during the Second World War, a raging battle between the Wehrmacht and the Scots troops took place. Despite the layers of rusting shells and shrapnel, it’s a freeride paradise here. 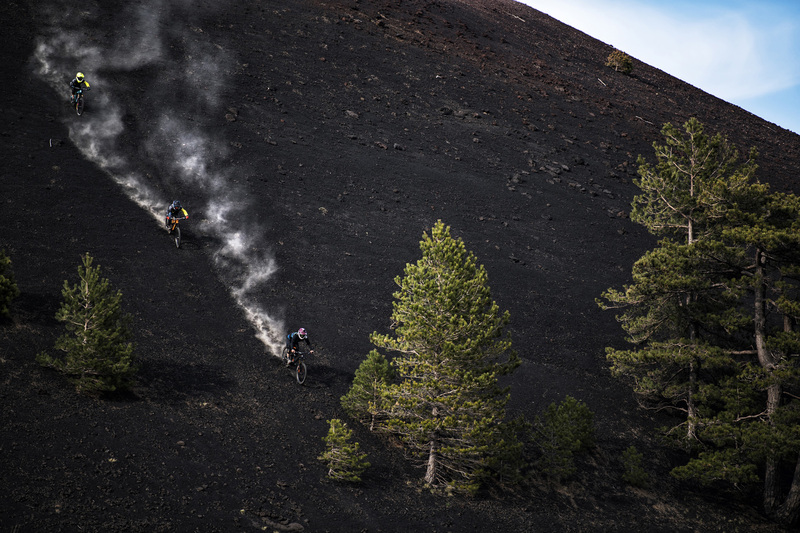 The next few days we spent exploring the lava terrain beneath Etna, so that the boys can get used to riding on the lava gravel, which is a new thing to them. On a loose, coarse surface you cannot steer very well, let alone brake, but the boys seem to handle everything with straight A’s. The “D Day” is here and I get up at 2:30 AM in the morning. We’re taking only the necessary equipment, sleeping bags, filming equipment, and cameras. Excited from the anticipated moments, we jump into the car and rush to catch the morning ferry that takes us to the mysterious Stromboli volcano. Although it is just over nine hundred meters in altitude, it is impressive when viewed from the sea level. The boys stared at “her” with open mouths, but surprisingly no one asked – how do we get up there? 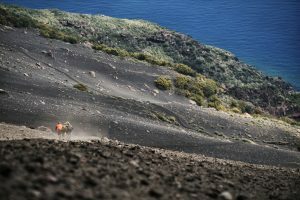 When the big lava rocks started turning into lava dust while descending the Stromboli ridge, the boys started really enjoying themselves because they felt like surfers. Sulphurous vapours and steaming spots were like trials for the boys’ psychical endurance, making it a good life experience. Some volcano fissures reach up to 1000 °C. 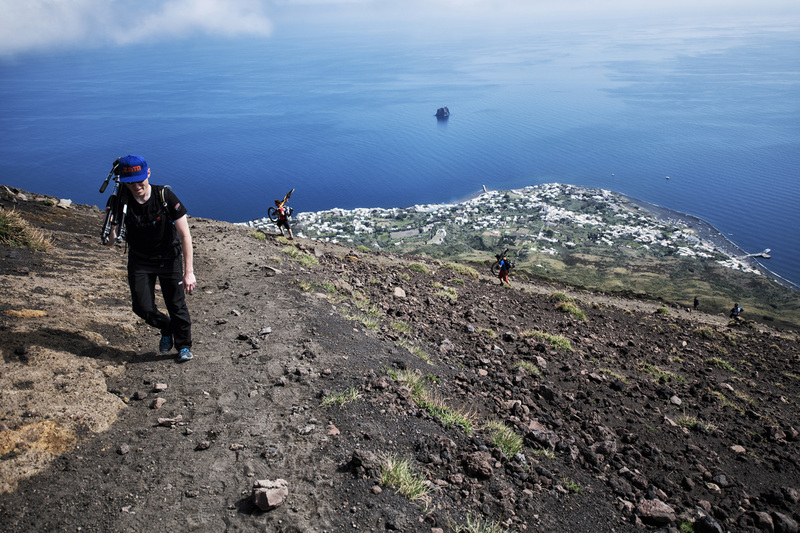 When you reach the peak of the island of Volcano Monte Aria (499m elevation) you can treat yourself to a stunning view of the Lipari Islands and the barely distinct Stromboli in the background, if you look the other way you’ll see the snowy Etna. 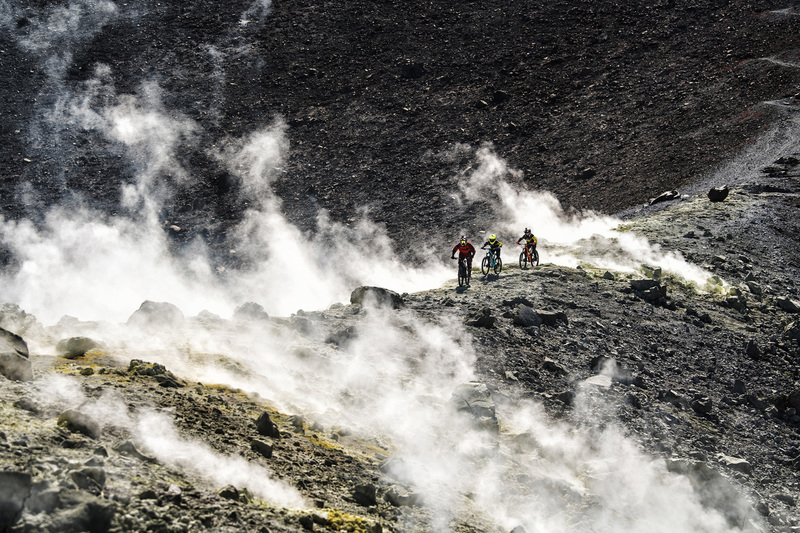 Pictured is a ride on the lower edge of the sulphurous volcano and waiting for the ferry. 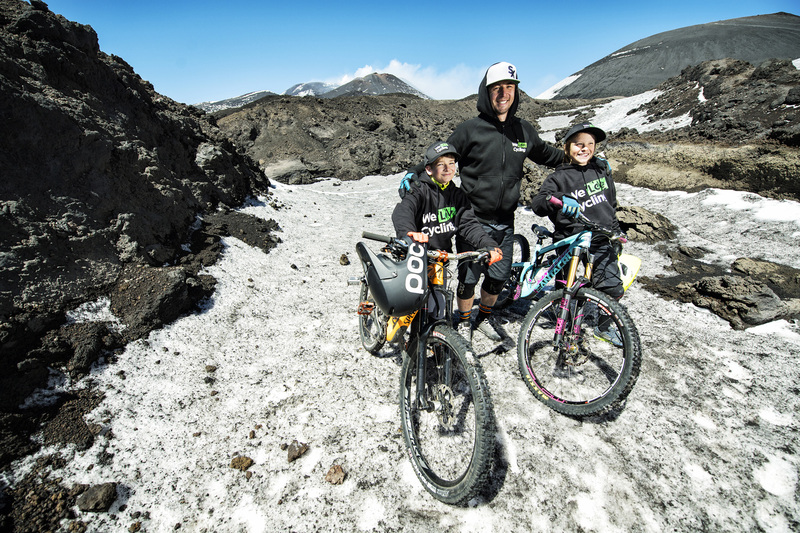 At the highest point of the island – the Vancori peak (924 m above sea level) – we climb under the guidance of a volcano guide and with the support of the local community. The trip took three hours, and I have to say I admired the boys’ fathers who dragged both the backpacks and the bikes up for their young riders. The closer we got to the peak, the more often our guide radio called the control centre that monitors volcanic activity around the craters. The volcano has been active for the last two thousand years and the lava splashes can be seen two to three times per hour at peak activity. 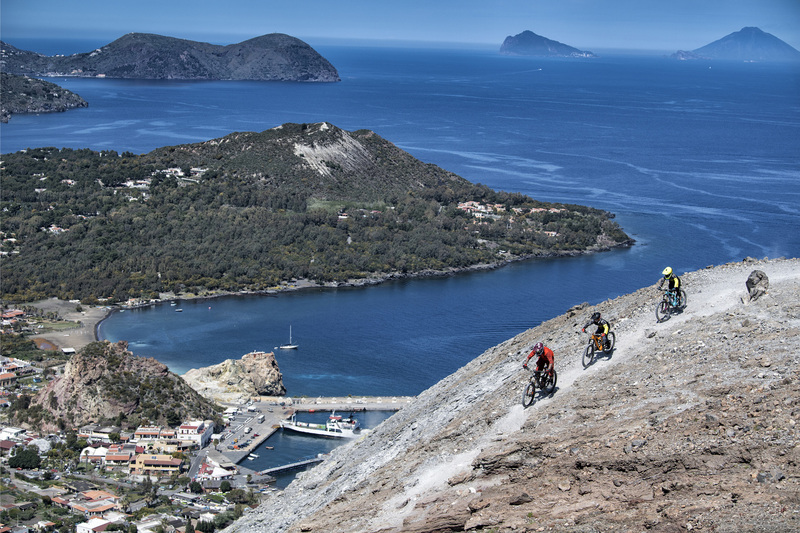 Access to the volcano is therefore regulated by the mayor of Lipari. 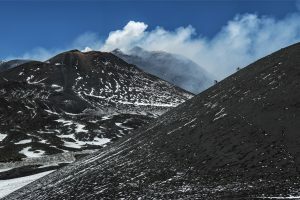 Etna’s peak is covered in snow year-round and it’s not possible to go directly near the crater because Etna belongs among the world’s most active volcanoes. Pictured Adam, Gaspi, and Klokan with the Etna smoking in the background. The strong wind was making the already unpleasant journey among sharp lava rocks and numerous eruptions even more strenuous. In spite of exhaustion, I try to keep both boys in a state of psychological well-being, and I encourage them in overcoming yet another difficult meter leading to the top. And now, ladies and gents, we’re going down! 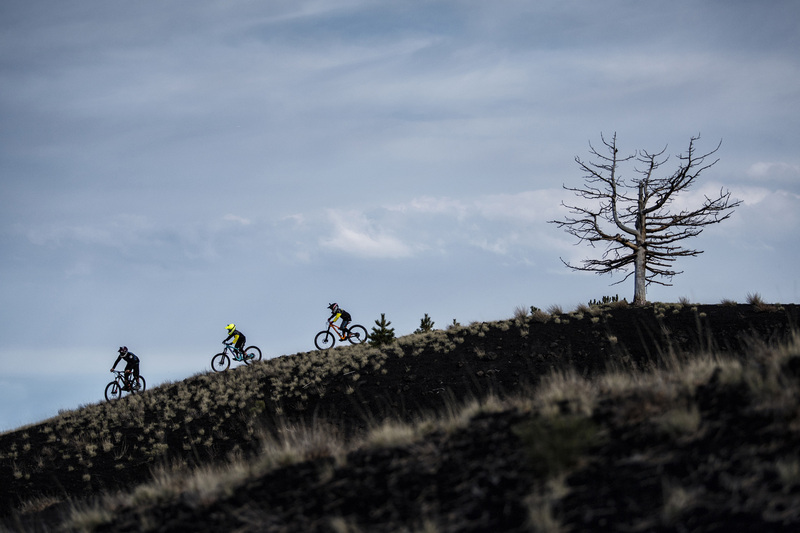 The guys are a little nervous, but after trying out a few turns and a few freeride bits, they calm down and ride faster and faster, so the camera and video crew must shield their lenses against stray shooting rocks. We hurry back to the sea as fast as we can to get the afternoon ferry. Finally, we can say – yes, we did Stromboli! Somewhere in the distance, another destination is waiting for us: the island of Vulcano, which gave its name to all the volcanoes of the world. We fall asleep drained and exhausted but there is not much sleep happening because of mosquito attacks. Since morning, it is awfully hot and ahead of us is another climb, this time to the top of the Vulcana – Monte Aria (499 m). On the edge of the crater are fumarols, which release hot sulphur vapours to the surface, with temperature of up to 1000 °C. The boys are scared at first, but when they see Mila with a cigarette in the middle of the steaming sulphur, they go into it! The demanding hot day completely wear us out and we feel dehydration until the second day. But another volcano is behind us! The take off before a steep section is always crucial for calming the nerves of the boys, they just mustn’t lose their cool after that! 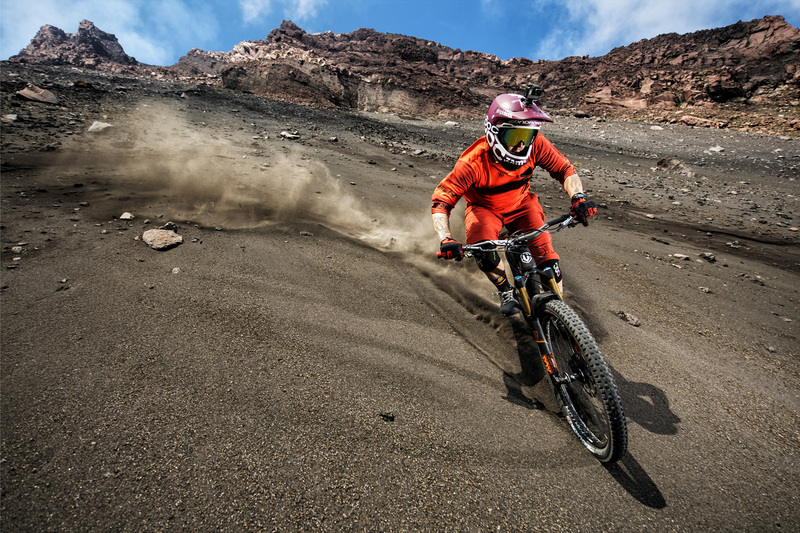 Calanchi di Biancavilla – a freeride paradise approx. 30 km from Etna – a district full of shrapnel shells, spent cartridges, and even unexploded ammunition, reminders of the fierce fights of World War II. 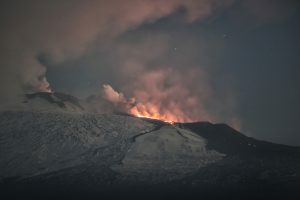 Lava coming down the side of Etna is visible as far as 50 km during the night hours. Now, the last one is waiting for us, the biggest one – Etna. After a day of rest, we all have a great motivation to take the highest active volcano, which reaches twice the altitude of Vesuvius. Unfortunately, you cannot descend from the very top, which lies in 3329 meters. Besides this, the figure keeps constantly changing – Etna measured 21 meters more until 1981. The decline is due to an eruption and release of magma. Currently, the volcano is active virtually nonstop. Two seconds after this was taken, Adam (in the middle) was catapulted over the handlebars when he met a huge stone in a very steep section of Etna. Luckily, Vojta riding behind him missed him by measly 20 cm, otherwise they would both be eating dirt. 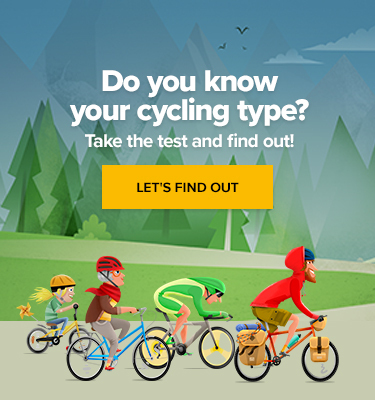 But Adam is a tough cookie, he just kicked the bike, let out a yell, and went on riding. We are trying to reach the peak through a safe zone that lies in the permafrost area. Boys enjoy surfing on the snow and want to do it repeatedly, but the time is running and we still have a fair amount to ride from the base camp, where Giuseppe Coco’s guide waits for us. After riding down dusty ravines, paths, and several smaller craters, we get to the local trail that leads us to our destination in Zafferan. The third active volcano is behind us! We all leave with the feeling that we have endured it healthy and without injuries. This challenging expedition has not only left plenty of impressions in the heads of twelve-year-old boys, but has moved us further. This is the only thing that no one can take away from us – experiences!